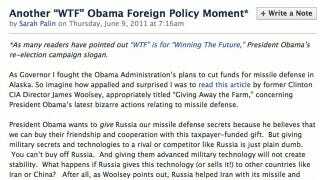 Sarah Palin Concocts A New Meaning For "WTF"
Sarah Palin's cursing doesn't get much rougher than "gosh darnit," so naturally her followers were unsettled when she posted a Facebook rant about President Obama giving away missile defense technology to the Russians under the title "Another 'WTF' Obama Foreign Policy Moment." Refusing to submit to such "gotcha" acronyms, she later added an asterisk to explain, "As many readers have pointed out 'WTF' is for 'Winning The Future,' President Obama's re-election campaign slogan." No double entendre here, people!